We’ve all played first-person shooters. Team Deathmatch. Capture the Flag. Zone control. Every one of these modes is popular to almost every gamer in some form or another. One side pitted against the other in a fight to victory. Many games have done a variety of things to try and make this dynamic more interesting. Various abilities for characters. Unique parts of the map that can turn the tides. 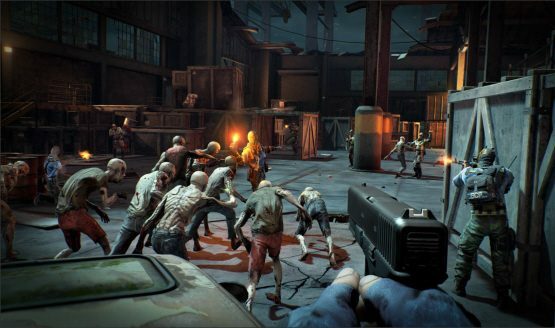 Dead Alliance adds zombies. Though the two teams may be taking on one another, the maps are crawling with undead, mostly harmless at first though they will take a bite if you get too close. These zombies present an interesting challenge in positioning, as strategies, like posting up and waiting for an opponent to round a corner, can quickly be ruined by the hordes of decaying flesh around you. It’s a brilliant solution to camping in first-person shooters, but it’s not all that the zombie hordes in Dead Alliance are good for. 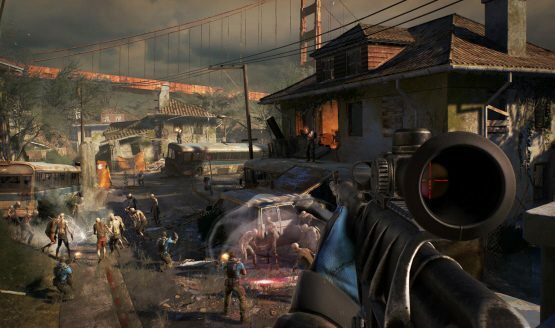 There are a variety of character abilities called zMods that will actually make the zombies work for you. The Enrager makes a single zombie super powerful and sends them running towards the nearest opponent. The PAM grenade turns four zombies to your side but leaves them as regular grunts that can easily be mowed down. Yet another device will repel all zombies in the area, effective for clearing off a king of the hill point and using them as a living dead moat, surrounding it while you remain in the safety zone. In a couple of quick matches, I found that I used the zombies for kills far more than I did my weapons. It was fascinating how much needing to focus on enemy zombies, the general horde, and enemy players really upped my need for spatial awareness. I’m sure the dynamic will change once players are able to get their hands on the game and get used to the mechanics, but for now, it was too easy to just enrage a zombie and expect that my opponents wouldn’t see the brute coming, or underestimate the big guy as a threat. Even the four zombie swarm created by the PAM grenade got me a fair amount of kills, and I was far more often shooting enemy zombies than I was other players. The beta for Dead Alliance launches on July 27th, so it will be interesting to see if the public agrees, but I do think the gunplay could use a little work. It’s definitely not at the level of something like Battlefield, Titanfall, or Call of Duty, and I worry that the success of Dead Alliance will hinge on its zombie gimmick rather than reliably fun gunplay. If they can tighten up the gunplay and make the human vs. human firefights as entertaining as using zMods to eliminate the enemy team, Dead Alliance could possibly see its way to a position of power in the competitive FPS community. For now though, using a horde of zombies as a viable weapon in an FPS seems like just the kind of thrill ride the genre could use. Dead Alliance is releasing on August 29th, 2017 for PS4, Xbox One, and PC. Check out all of our E3 2017 coverage.